Our records show you may have purchased or received a Gerber� Bear Grylls Parang Machete, sold by L.L.Bean under Product ID 271070. 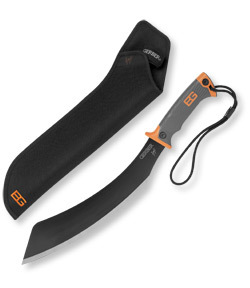 In cooperation with the US Consumer Product Safety Commission, the manufacturer, Gerber, is recalling the machetes manufactured and sold in 2011 and 2012. A weakness in the area where the handle meets the blade can cause the handle or the blade to break during use, posing a laceration hazard. For your safety, please stop using the recalled Parang machete immediately. As always, our 100% satisfaction guarantee applies. If the options provided by the manufacturer are not acceptable or if you are not satisfied with this product for any reason, you may return it to us for your choice of a full refund or a gift card.